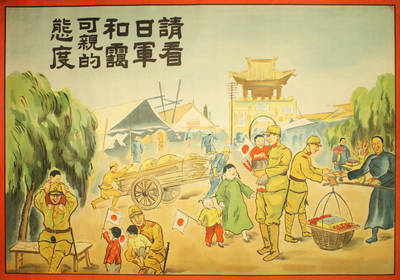 Propaganda poster, in Chinese, produced by Japanese-sponsored governments in China during Sino-Japanese War (1937-1945). These governments were established by major Japanese military commands, and posters were used to promote cooperation between Chinese and Japanese. English translation is "Please see how kind and affable the Japanese Army is." Chinese: 請看日軍和靄可親的態度. Translations made by Tanya Cao, M.L.S., M.A.B. Color Poster, 30" x 21"